Good morning guys, Does anyone of you know what is happening with the android update for our phones here in the UK? Does anyone of you know what is happening with the android update for our phones here in the UK? I have been searching in every forum and the lack of news has been what I have found so far. Someone people claim that our network carrier might being blocking the updates for our terminals, however I have already tried almost everything and still, no OTA. Any suggestions or updates here in the UK? I have also TA-1055 in Č, R. and Pie still nothing. So I proceeded according to the advice on the site * removed * TECHMESTO and I made the installation manually, the phone is error-free and when installing you will not lose any data. I did not make the factory setting. Nothing here either on my UK Nokia, I'm pretty disappointed really with Nokia, not so much for the lack of the pie update but the fact my phone is still stuck on the August security patch. This is not at all what I expected when buying a Nokia branded Android one handset. This will most likely be my last Nokia phone. Do what I done today my ta-1055 was on August security patch until I put an re some in phone restarted and up came September security patch. Sorry spelchecker ..should read put an ee.sim card in phone and restart.manual check and September security patch.will apear.. Thanks for that but I haven't got an ee SIM available right now, I'm on the Tesco network and tried a 3 mobile sim and still no joy. I have bought my phone sim free and even without the SIM card, there is no update available. I am still with the August security patch. My carrier is the 3 but I have the feeling this carrier is not the best one for updates. Tomorrow I am going to buy an ee sim card just to force the upgrade. In some countries the same Nokia terminal have already got the pie and here in the UK, nothing so far. What a disappointment Nokia. I don't think I said I would never buy another Nokia phone because of delayed updates, I simply stated that this is likely to be my last Nokia phone. I have had nothing but trouble with the Nokia 7 plus and have had to have the handset replaced under warranty as the previous one constantly rebooted. Nokia's support in the UK is non existent and it took ages to get it sorted and only then by involvement of my credit card company. Guys, it will come. Maybe try to contact with local PR agency, they should know when your phone recive update the update. A month on and I still can't find a way to get PIE without a PC anyone had an update? No nothing on TA-055. Tried a support chat last week, they said had been released in UK but couldn't say when upgrade would take place. Said it could be carrier holding back but have a sim-free phone and even after resetting phone and only connecting WiFi nothing.....so frustrating!! We all have been scammed. I have been thinking in selling my Nokia and buy another brand. Nokia doesn't care about its costumers, at least in the UK. Their main concern is the Indian market and the launch of new products almost every month, so don't expect any word from them soon. @joao rosado totally agree with you, mine is 6 months old I'm going to see where I stand from where I bought it from as I feel I've been missold this phone if they won't I'll my credit card company. Anyone had the update yet? No update here ion my UK handset still stuck on 8.1 with the August security patch. Got a refund from my retailer for my 7 plus sick of nokia messing about so I treat myself to a oneplus 6 happy day's, bye bye nokia that's me done over and out. How did you manage to get a refund? Through you cc company? Yep, I also just got pie TA 1055. . UK on Vodafone. Hooray. Better late than never, but still disappointing from Nokia. Looks good and running well so far. 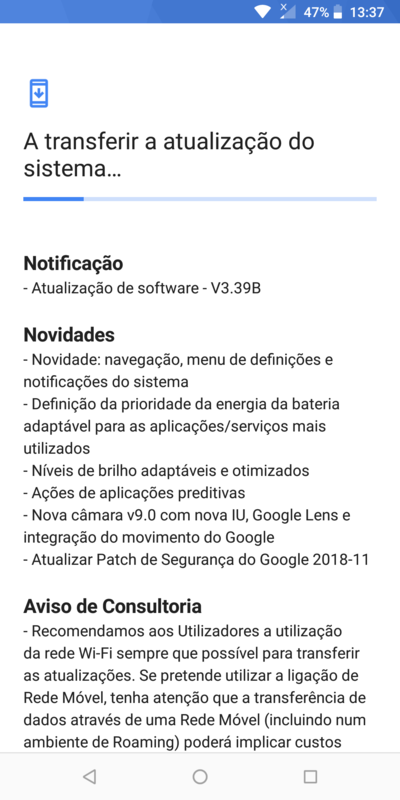 Got the updstes of Pie and Security Patch last night.